This is Day 22 of 31 Days of Intentional Community. Thanks for reading along! Looking for an easy way to engage with someone in your community? Feeling burdened by life's busyness but still wanting to connect with those around you? One of the best pieces of advice I've received as a way to get some quality time with a friend is simply this: run errands together. Heading out for an oil change? Ask a friend to meet you in the waiting room, or for a walk around town while your car gets worked on. Library books overdue? Call up a friend and make a library playdate-- the kids might even occupy themselves for a while so you can get some mama time to chat. 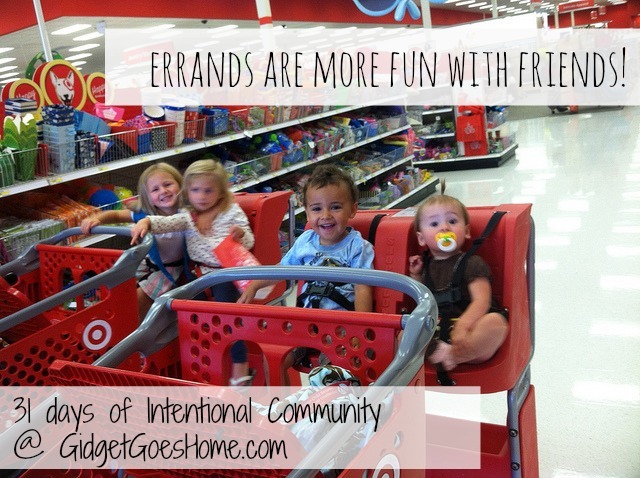 I love turning the mundane tasks of life into opportunities to spend time with a friend-- it makes the errands more enjoyable and provides a chance to really do life together.